Please join us for the inaugural online porcelain sale. We have mixed it up a bit by blending 20th century and 19th century design together. Items in this sale have been chosen for their design and functionality. The sale features stylish dinnerware and decorations by makers including Meissen, Mason’s Ironstone, Ginori, and Anna Weatherly. Whether you are looking for a dinner service or shopping for that perfect serving piece, our online sale has a selection to suite every taste. 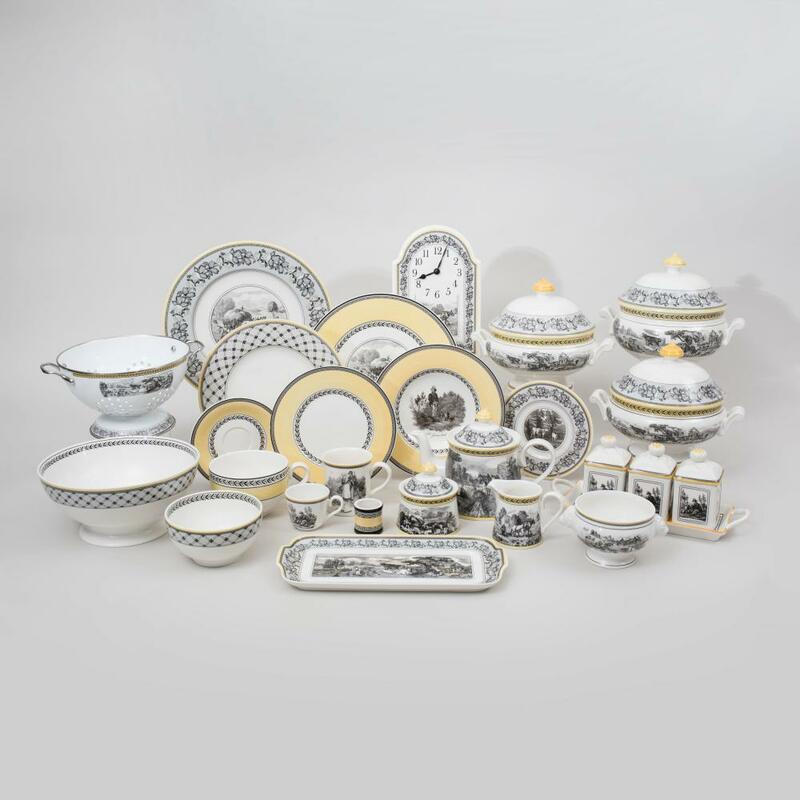 We have a large selection of tableware designed by Piero Fornasetti, Versace, and Aldo Rossi. We have carefully curated this sale with an emphasis on quality and taste. Join us October 12th to update your tablescape and enhance your next dinner party! The following Conditions of Sale are Stair Galleries & Restoration, Inc. (Stair) and the consignor's entire agreement with the purchaser and any bidders of property being offered. They may be amended by posted notices or announcements made during the sale. By bidding at auction, you agree to be bound by these terms and conditions. All property is sold "AS IS" without any representations or warranties by Stair or the consignor, express or implied, as to merchantability, fitness for particular purpose, attribution, authenticity, the correctness of the catalogue or other description of the physical condition, size, quality, rarity, importance, medium, frame, provenance, period, age, date, exhibitions, literature or historical relevance of any property and no statement anywhere, whether oral or written, whether made in the catalogue, salesroom posting or announcement, invoice, condition report or elsewhere, shall be deemed such warranty, representation or assumption of liability. Prospective bidders should inspect the property before bidding to determine its condition, size, and whether or not it has been repaired or restored. Stair strongly encourages and advises all prospective bidders to examine personally prior to the auction any lots in which they are interested. All lots are available for inspection prior to the auction. While Stair is not obligated to provide a condition report of each lot, condition reports for most items can be found online at Stair website, www.stairgalleries.com. Prospective bidders are encouraged to contact Stair directly for additional information regarding the condition of any lot. Stair does not warrant the condition of any item. The absence of a condition statement does not imply that the lot is in perfect condition or completely free from wear and tear, imperfections or the effects of aging. Condition statements by Stair, whether appearing in the catalogue, online, or at a person's request, are based on a visual inspection and are for guidance only. Such condition statements should not be relied upon as statements of fact and do not constitute a representation, warranty, or assumption of liability by Stair. Condition is always a subjective evaluation, and final responsibility rests with the buyer to assess the condition of any item sold by Stair. Stair and the consignor make no representation or warranty, express or implied, that the purchaser will acquire any copyright or reproduction rights in any property. Stair and the consignor are not responsible for errors and omissions in the catalogue or any supplemental material. Some of the lots in this sale are offered subject to a reserve, which is the confidential minimum price below which the lot will not be sold. A representative of Stair will execute such reserves by bidding on behalf of the consignor. Stair reserves the right in its sole discretion at any time before bidding commences to withdraw, combine or divide any lot and shall have no liability whatsoever for such withdrawal, combination or division. A buyer's premium will be added to the hammer price and is payable by the purchaser as part of the total purchase price. The buyer's premium is 23% of the hammer price. The highest bidder acknowledged by the auctioneer shall be the purchaser. Stair reserves the right to reject any bid. The auctioneer shall advance the bid at his/her sole discretion. The auctioneer has absolute and sole discretion in the case of error or dispute with respect to bidding and, whether during or after the sale, to determine the successful bidder, to re-open bidding, to cancel the sale or to re-offer and re-sell the item in dispute. If any dispute arises after the sale, our sale record is conclusive. In our discretion, we will execute order or absentee bids and may accept telephone bids, as a convenience to clients who are not present at auctions; we are not responsible for any errors or omissions in connection therewith. Prospective bidders should also consult stairgalleries.com for the most up to date cataloguing of the property in this catalogue. All bidders may be required to provide a government-issued identification confirming the bidder's name and principal address of residence or business; in addition, bidders may also be required to provide an additional residential or business address and telephone number, credit card information, and other credit-related information. Stair reserves the right to require a deposit prior to bidding. By participating in the sale, you represent and warrant that any bids placed by you or on your behalf are not the product of any collusive or other anti-competitive agreement and are otherwise consistent with federal and state antitrust law. Stair may also offer clients the opportunity to bid online via Invaluable, Bidsquare or other online platforms for their sales. By participating in a sale via any of these online platforms, you acknowledge that you are bound by these Conditions of Sale as well as the additional terms and conditions for live online bidding. By participating in a sale via any online platform, bidders accept the online terms as well as the relevant conditions of sale. If bidding using an online platform, an online bidding service fee of additional 5% of the hammer price (for a total of 28% of the hammer price, will be added to the hammer price as part of the total purchase price. Subject to fulfillment of all of the conditions set forth in these Conditions of Sale, on the fall of the auctioneer's hammer, the contract between the consignor and the purchaser is concluded, and the winning bidder thereupon will immediately pay the total purchase price. Title in a purchased lot will not pass until Stair has received in full the total purchase price in cleared funds. Unless exempted by law, the purchaser will be required to pay New York, New Jersey or Connecticut state sales tax as applicable, any applicable local sales tax, and any applicable compensating use tax of another state. Stair accepts checks (personal or business check in US dollars certified by a US bank, a cashier's/banker's check drawn on a US bank or US money order), cash (US currency not to exceed $10,000 in a single or multiple related payments) or credit card (American Express, Visa or MasterCard) for payment. The purchaser's obligation to pay immediately the full purchase price is absolute and unconditional and is not subject to any defenses, setoffs or counterclaims of any kind whatsoever. Stair is not obligated to release a lot to the purchaser until title to the lot has passed. The purchaser agrees to pay Stair handling charge of $22 for any check dishonored by the drawee. Property purchased from Stair by a successful bidder will not be released to such bidder until the full payment of the total purchase price (including the buyer's premium and online bidding service fee, and all applicable sales taxes) have been made. In addition to other remedies available to us by law, we reserve the right to impose from the date of sale a late charge of 1.5% per month of the total purchase price if payment is not made in accordance with these conditions. Please note that Stair reserves the right to refuse to accept payment form a source other than the buyer of record. The purchaser must remove all property from the auction premises at his/her expense the day following the auction by 1:00 pm. If the property is not picked up within 10 days of the auction, Stair reserves the right to charge a minimum storage and handling charge of $20 per lot per day. Stair also reserves the right to send the property to a public warehouse for the account and at the risk and expense of the purchaser, to be released only after payment in full of all removal, storage, handling, insurance and any other costs incurred, together with payment of all other amounts due to us. It is the purchaser's sole responsibility to arrange to collect or ship the property and to identify and obtain any necessary export, import, firearm, endangered species or other permit for the lot. Stair and the consignor make no representations or warranties as to whether any lot is or is not subject to export or import restrictions or embargoes. Purchasers are reminded that Stairs' liability for loss or damage to sold property shall cease no later than 10 days after the date of the auction. If the purchaser fails to fulfill or comply with any of the conditions herein, the purchaser shall be in default and, in addition to all legal remedies available to the Stair and the consignor by law, including, without limitation, the right to hold the purchaser liable for the total purchase price, including all fees, charges and expenses more fully set forth herein, Stair, at its option, may: a) cancel the sale of that, or any other lot or lots sold to the defaulting purchaser at the same auction or any other auction, and retain all payments made by the purchaser as liquidated damages; b) resell the purchased property whether at public auction or by private sale, for the account of the purchaser, in which case the purchaser shall be liable to Stair for all its costs and damages, including the commissions for both auctions; c) remove the property to a public warehouse for the account and at the risk and expense of the purchaser; d) charge interest at such rate as we shall reasonably select, or e) effect any combination thereof. In any case, the purchaser will be liable for any deficiency and any and all costs, handling charges, late charges, expenses of both sales, our commissions on both sales at our regular rates, legal fees and expenses, collection fees and incidental damages. Payment will not be deemed to have been made in full until we have collected good funds. In the event that purchaser fails to pay any or all of the total purchase price for any lot and Stair nonetheless elects to pay the consignor any portion of the sale proceeds, the purchaser acknowledges that Stair shall have all of the rights of the consignor to pursue the purchaser for any amounts paid to the consignor, whether at law, in equity, or under these conditions of sale. In addition, defaulting purchaser will be deemed to have granted and assigned to Stair a continuing security interest of first priority in any property or money of or owing to such purchaser in our possession, custody or control, in each case whether at the time of the auction, the default or if acquired at any time thereafter, and we may retain and apply such property or money as collateral security for the obligations due to us. We shall have all the rights accorded a secured party under the New York Uniform Commercial Code. Purchaser hereby agrees that we may file financing statements under the New York Uniform Commercial Code without his/her signature. In no event will our liability to a purchaser with respect to an item of property exceed the purchase price actually paid by such purchaser for such item. These Conditions of Sale as well as bidders', the purchasers' and our respective rights and obligations hereunder shall be governed by and construed and enforced in accordance with the laws of the State of New York. By bidding at an auction, whether present in person or by agent, order bid, telephone, online or other means, all bidders including the purchaser shall be deemed to have consented to the exclusive jurisdiction of the state courts of, and the federal courts sitting in, the State of New York. The copyright in all images, illustrations and written material produced by or for Stair relating to a lot, including the contents of this catalogue, is, and shall remain at all times, the property of Stair and shall not be used by the buyer nor by anyone else, without our prior written consent. Stair reserves the right to reproduce any image of the lots sold in this catalogue. We suggest requesting a quote for packing and shipping prior to bidding on an item, as you will be responsible for collection or shipping if you are the successful bidder. We ask that you make collection arrangements within 10 days of your purchase. Below is a list of shippers our clients use on a regular basis, but feel free to use your shipper of choice. Sales tax is due on all purchases collected in person from the gallery and on all purchases shipped to Connecticut or New Jersey unless a valid Resale Certificate is on file. The property is sold in "as is" condition and without recourse, and neither the Gallery nor the consignor makes any representations or warranties, express or implied, as to catalogue description, attribution, authenticity, provenance, origin, size, age or condition of any of the property offered for sale. It is the responsibility of the purchaser, prior to the auction, to examine the property and make a determination as to the value, condition, description, authenticity, provenance, origin, size and age of the property. All bidders are strongly urged to review the condition report for the object that you are bidding on, if you have not viewed the item in person at our Gallery. Since we are not professional conservators or restorers, we urge you to consult with a restorer or conservator of your choice who will be better able to provide a detailed, professional report. Prospective buyers should inspect each lot to satisfy themselves as to condition and must understand that any statement made by Stair is merely a subjective, qualified opinion. Notwithstanding this report or any discussions concerning a lot, all lots are offered and sold "as is" in accordance with our Conditions of Sale. Description: Black printed mark.Comprising:A set of six platesA demi-tasse cup and saucerA coffee cup and saucerThe plates 10 in. diam. (8 pcs). Condition Report: Very minor wear, in good condition. Description: Printed mark.12 in. diam. Condition Report: A few scattered chips, most in good condition. Description: Red printed mark.10 3/8 in. diam. Condition Report: Minor wear to the decoration, in good condition. Description: Green printed mark, retailer's mark for Tiffany & Co.Comprising:Twenty dinner platesTwenty-one soup platesThe dinner plates 10 1/4 in. diam. (41 pcs). Condition Report: Very minor wear, a few with tiny nicks. In overall good condition. Condition Report: There are a few chips to the saw tooth edges, most in very good condition with minor wear. Description: Inscribed in red.10 1/4 in. diam. Description: With panels of classical figures.14 1/2 x 9 x 6 1/4 in. Condition Report: There is rubbing and some loss to the luster at handles and rim. Hairline crack to one handle. Otherwise in good condition. Description: Printed mark to the reverse.10 1/4 in. diam. Condition Report: In overall good condition with minor wear consistent with age and use. Description: Green printed marks.5 in. wide over handles. Condition Report: Minor wear overall, in good condition. Description: Underglaze blue mark.9in. diam. Condition Report: In overall good condition with minor wear. One plate with a chip to rim, another with a surface crack (does not extend through the body). Condition Report: Minor wear and in overall good condition, a few tiny losses to decoration. One plate with a small glaze gap under the rim. Description: 6 x 7 x 5 1/2 in. (overall). Condition Report: Minor wear and rubbing to the gilding, minor nicks to the underside. One stand with restoration. Description: Comprising:Two platesFour saucer dishesA larger saucer dish Two shaped oval dishesThe plates 9 in. diam. (9 pcs). Condition Report: Expected wear with a few nicks and chips overall. One plate restored. Condition Report: Very minor wear, a few with nicks and losses to decoration. In overall good condition. Description: Blue printed mark.The elephant 5 x 8 x 3 in. Condition Report: Very minor wear and in good condition. Description: Blue crossed swords marks.7 x 11 1/2 x 6 1/4 in. Description: 10 x 8 1/2 x 12 1/2 in. Description: Blue printed mark.16 x 30 in. (overall). Description: Each with gilt printed marks.8 1/2 in. high. Condition Report: Minor wear, in good condition. Description: Gilt printed mark.15 in. high. Condition Report: In overall good condition. Condition Report: In overall good condition, some scattered nicks and a few chips.